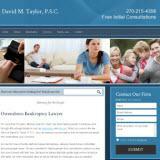 The Law Office of David M. Taylor, PSC has been representing a wide variety of clients since 1988. Concentrating in Consumer Bankruptcy, Divorce and Social Security. The office also represents clients in criminal and personal injury cases as well as general civil litigation. Our office is open from 8:00 a.m. until 5:00 p.m. Monday through Friday and Saturday and evening appointments are also available. The office provides a free initial consultation and payment plans for services.